At NAB 2017, SES announced that two U.S. MVPDs have launched the first commercial linear UHD services to cable and IPTV subscriber homes using SES’s satellite-delivered, packaged UHD solution. Marquette-Adams of Oxford, WI, and Highlands Cable Group of Highlands, NC, have licensed the SES-provided UHD programming through Vivicast Media and have initiated their UHD offerings following successful trials of the SES platform. 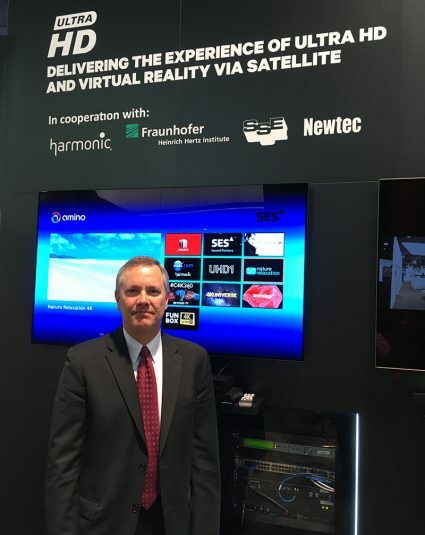 In addition, SES rolled out a live VR-over-satellite demo in conjunction with Fraunhofer Heinrich Hertz Institute HHI and Newtec. The live VR broadcast originates from Fraunhofer HHI’s OmniCam-360 camera, which captured the sights and sounds of the SES booth. The 10K x 2K panoramic broadcast signal was transmitted over an SES satellite to multiple UHD TV screens and VR goggles at the SES booth and other locations throughout the Las Vegas Convention Center. SVG sat down with SES VP, Business Development, Steve Corda during NAB 2017 to discuss the big UHD announcement, how SES is pushing the pace of UHD adoption, and how he sees the next year playing out for UHD. How significant is the announcement of two MVPDs launching commercial linear UHD services for the industry? It’s hard for me not to get excited because it was two years ago here when we did a live UHD demo and I said I believe we will have partners within two years. Here we are today with two MVPDs in the U.S. launching Ultra HD services with us. A lot of key things happened along the way. We had our first trial operator, Armstrong, in the summer of 2015. That was I think the first step for us to start to understand every little piece of this ecosystem. We had to find the bottlenecks holding [linear 4K service] back, so that was the key objective. Then we added a few more channels, including the NASA Channel. A few months later, we got a couple more operators and then more channels. Then you fast-forward to today, and it’s more than 20 operators and 10 channels. Without the compelling content, it’s hard to attract the operators. It’s always all about the content. But it was hard to get the content unless you had the operators because they want to make sure they have visibility. It really spun up around December of this past year, when we got five more channels and 15 operators within roughly 90 days. That got us to today. The goal always was to convert them to commercial at some point. So we’re pleased that it happened right now. It is also being driven by the number of 4K TVs deployed: nearly 20 million by the end of last year. That really was a turning point. In January/February, we started working on HDR, and, in March, we launched the world’s first high-dynamic-range linear channel in hybrid log gamma. HLG is great because it doesn’t have the metadata issues and is backward-compatible, so, on a standard-dynamic-range TV, it looks great; it looks amazing on a high-dynamic-range TV. This year has seen a number of big milestones for us with the channel buildup, the number of operators, the high dynamic range, and now the first operators delivering channels to their subscribers. Now that you have commercial linear consumer UHD services, how do you see the next 12 months playing out? I definitely see [more UHD services] continuing to launch. We’re looking at more channels. We want to continue to add a variety of genres so that the operators can select and create their own bundles out of what we have. We do have a number of other operators waiting in the wings to become trial participants. We expect to see, over the coming months, more conversions from trial to commercial for sure. If I were to fast-forward to 18 months from now, I think we’ll have twice as many channels as we have today. I don’t think that’s unrealistic given what we’re seeing in development. How is SES looking to help promote creation of more 4K content to populate these channels? The platform that we have created is truly an ecosystem because we helped to create the channels. Three of the channels that we have operating today were essentially generated as a result of this ecosystem: C4K360, 4K Universe, and Nature Relaxation. We are an incubator, in a sense, for these new channels. What are the most significant remaining obstacles to development of the live linear 4K UHD ecosystem? Going beyond the need for content, we’re focused on the home and set-top boxes. That’s the last bottleneck that I would say is out there today: the availability of [UHD] set-tops. Less so on the IPTV side: those have been available for better part of a year now, and we’re seeing some of the first operators that come out are in the IP TV. We are going to see the cable systems follow fairly quickly. Arris is a big supplier of set-tops. One [UHD] unit has the Tivo environment [and] is shipping and readily available today. A lot of the operators that we’re working with intend to use those, so they’re starting to acquire the Arris set-tops and put those into their systems. I think, later in the year, you’re going to get some more-traditional [UHD] set-top boxes available for the non-Tivo environments. I would say that, certainly in the next few months, you’re going see those Tivo boxes coming out and being used, and, towards the end of the year, you will see more [UHD] traditional set-top boxes. What can you tell us about the VR-over-satellite demo at the booth? We have a VR [rig] that consists of 10 lenses; each lens picks up 36 degrees, creating a 360-degree view. We take each of those linear flat images, stitch them together, process the image to remove any distortion, send it over the satellite, and deliver it into a system that can distribute it as virtual reality. So this truly is an industry first. Do you see a future for VR content delivery via satellite? I think, if we rewind two years with Ultra HD, that was an opportunity for us to start to test it out. I think the same holds true for virtual reality. We don’t have any intention to launch VR in the next month or two; it’s something that’s going to take a little bit more time to work through. And just as we did with Ultra HD, once you get into the headend, how does it get delivered. I don’t envision us sending individual virtual-reality streams over the satellite because of the cost of capacity. But, if we can multicast out the general experience and individualize it at the headend, that seems like a logical model that we’ll be looking at. Do you foresee a future for 1080p HDR in lieu of 4K HDR? I would say we can’t go backwards in terms of technology availability. HDR is going to be available in Ultra HD TVs, [which] everybody’s going to buy because the price differential between Ultra HD and HD is not that great right now. We have Ultra HD TVs with HDR. If you do an HDR broadcast, I don’t think you’re really taking advantage of all of the capability. You, of course, get the higher resolution, but you get the higher pixel depth, you get the higher frame rates, and then, of course, HDR comes along as well. If you really want the true experience, I believe, it should be in Ultra HD, especially as the TV sets get larger and larger, because that’s where you need the resolution. If you’re in a sub–50-in.–TV range, maybe the difference between HD and UHD is not that great. I think there’s a significant difference between the two. To me, thinking of [1080p HDR] as an “in between” between HD and 4K doesn’t make sense, because you’re not going to go through two technology upgrades. You’re not going to go through half now and half later; I think you have to go all the way or nothing. How is sports driving the demand for 4K content? Do you have plans to deliver live sports content in UHD anytime soon? As we talk to the operators, we always ask what kind of [UHD] content they want. Sports is what they’re always asking for. I think that live sports in UHD and HDR is very key to the future. For satellite operators, I think satellite is going to provide a far superior experience than over-the-top for live UHD HDR content. So we’re looking at opportunities to bring that into our portfolio. Nothing to announce yet, but we do have discussions with the truck providers who have trucks that can handle 4K, as well as various sports groups. I’m hoping that, sometime this year, we’ll be able to have some [live sports UHD] content deals.